Mark Levene, PhD, is Professor of Computer Science, head of the Computer Science and Information Systems Department, and a member of the Information Management and Web Technologies Group at Birkbeck, University of London. His main current research interests are Web search and navigation, Web mining, and Web interaction. Professor Levene is the coauthor of A Guided Tour of Relational Databases and Beyond and the coeditor of Web Dynamics. 1.1 Brief Summary of Chapters. 1.2 Brief History of Hypertext and the Web. 1.3 Brief History of Search Engines. CHAPTER 2 THE WEB AND THE PROBLEM OF SEARCH. 2.2 Tabular Data Versus Web Data. 2.3 Structure of the Web. 2.4 Information Seeking on the Web. 2.5 Informational, Navigational, and Transactional Queries. 2.6 Comparing Web Search to Traditional Information Retrieval. 2.7 Local Site Search Versus Global Web Search. 2.8 Difference Between Search and Navigation. CHAPTER 3 THE PROBLEM OF WEB NAVIGATION. 3.1 Getting Lost in Hyperspace and the Navigation Problem. 3.2 How Can the Machine Assist in User Search and Navigation. 3.3 Trails Should be First Class Objects. 3.4 Enter Markov Chains and Two Interpretations of Its Probabilities. 3.5 Conflict Between Web Site Owner and Visitor. 3.6 Conflict Between Semantics of Web Site and the Business Model. CHAPTER 4 SEARCHING THE WEB. 4.1 Mechanics of a Typical Search. 4.2 Search Engines as Information Gatekeepers of the Web. 4.3 Search Engine Wars, is the Dust Settling? 4.4 Statistics from Studies of Search Engine Query Logs. 4.5 Architecture of a Search Engine. 4.7 What Does it Take to Deliver a Global Search Service? CHAPTER 5 HOW DOES A SEARCH ENGINE WORK. CHAPTER 6 DIFFERENT TYPES OF SEARCH ENGINES. 6.1 Directories and Categorization of Web Content. 6.5 Question Answering (Q&A) on the Web. 6.7 Special Purpose Search Engines. CHAPTER 7 NAVIGATING THE WEB. 7.1 Frustration in Web Browsing and Navigation. 7.5 The Best Trail Algorithm. 7.6 Visualization that Aids Navigation. 7.7 Navigation in Virtual and Physical Spaces. CHAPTER 8 THE MOBILE WEB. 8.1 The Paradigm of Mobile Computing. 8.4 The Navigation Problem in Mobile Portals. 9.1 What is a Social Network? 9.6 Power-Law Distributions in the Web. 9.7 Searching in Social Networks. 9.8 Social Tagging and Bookmarking. 9.10 Web 2.0 and Collective Intelligence. 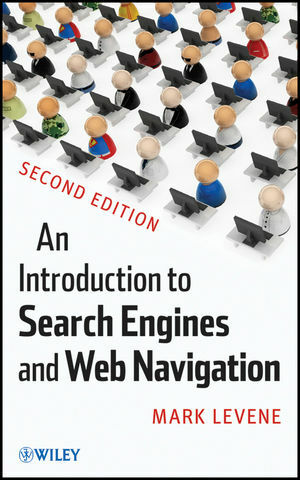 CHAPTER 10 THE FUTURE OF WEB SEARCH AND NAVIGATION.